Here’s my 27th February ‘Grimey Mondays’ show with the WORLD EXCLUSIVE from Diesle, Frisco, Riko, Chronik, Flowdan & G Man entitled ‘Horrow Show’ along with spinning the 3rd release on the Ghost House label from K1 entitled the “Apocalypse EP” and tracks from Discarda & M.I.K, Rossi B & Luca, myself Spooky, U.S.F, Sofia Maria, Kwam MC, Sketch’E, R1 Ryders, Trends, Moony, D.O.K, Swifta Beater, Uncle Dreama, Chimpo and many more! So, click HERE or the logos for the download! The 3rd release from my Ghost House label, the “Apocalypse E.P” by K1, is out now! Click the pic for the links to purchase. 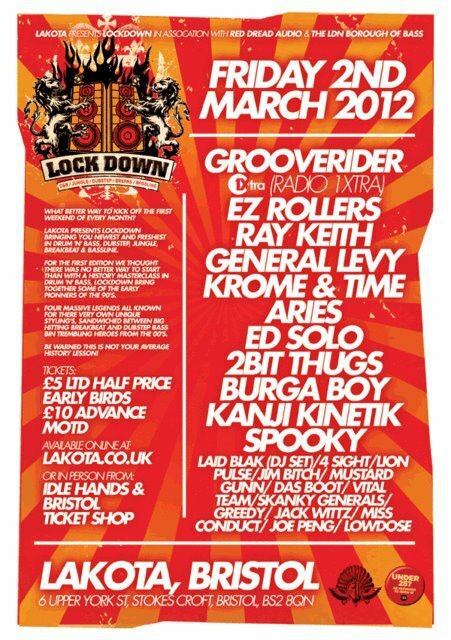 Catch me at Lockdown @ Lakota, Bristol this Friday 2nd March.